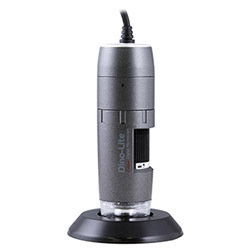 The Dino-Lite AM4815TL Edge series handheld microscope features improved optics for sharper images, Long Working Distance (LWD), Extended Depth of Field (EDOF), and Extended Dynamic Range (EDR). With these features, this model is extends Dino-Lite’s applications in long working distance to higher magnification range and better image quality. The specialized software bundled with this product (DinoCapture 2.0) allows users to calibrate the microscope, capture & annotate images, measure image features, and record video. 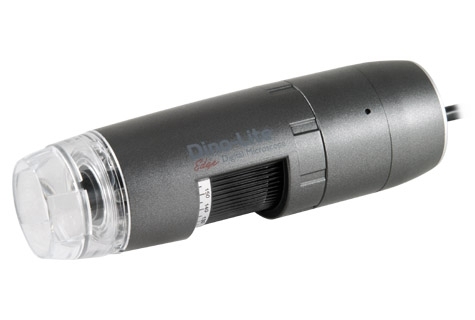 This model includes two Dino-Lite Edge series exclusive features that are accessible within the DinoCapture 2.0 software: Extended Depth of Field (EDOF) and Extended Dynamic Range (EDR). Extended Depth of Field (EDOF) is useful for capturing images of uneven surfaces. With this feature users can combine multiple images at different focal depths into a single composite image. In automatic mode, the EDOF algorithm selects images to display the best focal depth at every point within the field of view. In manual mode, users can select these images themselves. The final composite image retains all the information in the original photos. The original photos can be viewed by holding down the CTRL key within the preview window. Extended Dynamic Range (EDR) is useful for capturing images with uneven lighting, reflections or shadows. With this feature users can combine multiple images at different exposure levels into a single composite image. The EDR algorithm automatically selects images to display the best exposure level at every point within the field of view. The final composite image merges the information from the original photos to produce an image with the best possible lighting across the entire field of view. This model also features a scroll lock on the magnification dial to secure the dial and fix the focus and magnification, which can be helpful to prevent unintentional rotations of the dial. Other standard features include the MicroTouch shutter button for quick and convenient picture taking and eight high-intensity white LEDs that fully illuminate the viewing subject.